Today I will be reviewing Isosceles Triangle Nail Studs 3x5mm in gold Item #16677 from Born Pretty Store, they were provided to me for review. I was so excited to receive these because I’ve been looking for triangle studs but I couldn’t find any that would be the right size for my smallish nail beds and these fit perfectly! You get 20 in the pack and you could easily re-use them if you pop them off prior to polish removal. 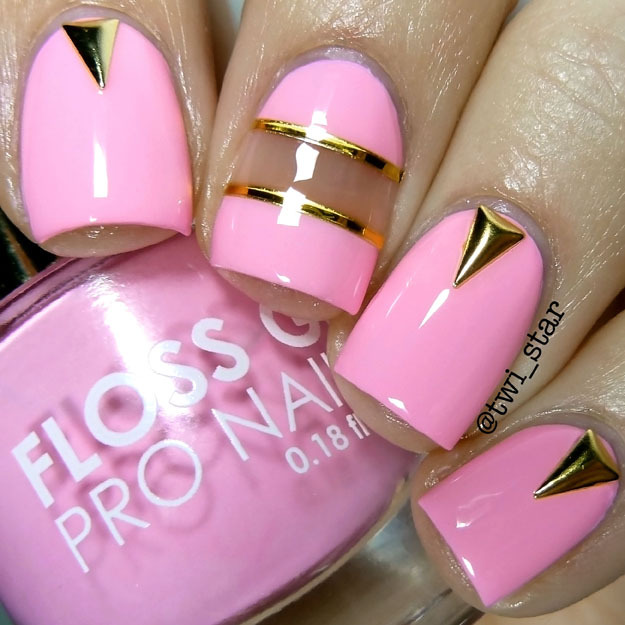 Check out my mani using the Triangle Nail Studs! For my mani I paired the triangle nail studs with Perf from Floss Gloss, a bright bubble gum pink crème. I thought the gold stud looks so great against the bright pink! I think the studs look pretty badass, I love them! They are a “3D” type stud or raised because they have a domed dimension to them. I applied top coat and placed them using a wax pencil. Here is my mani showing my fav top coat, HK Girl Top Coat from Glisten and Glow. For the middle accent nail I used straight vinyls from Vinyl It Up and then I added gold striping tape to accent the negative space. I think the gold tape plays nicely with the gold stud. On this macro shot you can see how dimensional the stud is, they are sized at 3x5mm and would fit on and size nail bed. My nails have a strong C-curve so very large studs often don’t lay flat for me but I don’t have a problem with these! I will be getting a lot of use out of these, they would look great with so many colors. Here I posed with my BOSS ring lol If you love studs then you have to have these! Isosceles Triangle Nail Studs 3x5mm in gold from Born Pretty Store Item #16677. Thanks for stopping by and checking out my review!